The New Mini-Fox River is the Perfect addition to Our Professional Series as an EDC and Light Field Knife. The Mini-Fox is smaller in the Blade than the Woodland Special and larger than the Little Creek and Pro-Scalpel. It fits perfectly in it's place in this Series. The Blade is Just the Right Size to be legal in most jurisdictions that allow any kind of Fixed Blade Carry . It has plenty of handle for quick or even sustained use with security and comfort. You can use it in Confidence for both Fine Work and Harder Use Tasks. We have Designed a Special Sheath for the Mini-Fox River that can be Worn Strong Side or Crossdraw. This New Sheath has the Sharpshooter Select-Slot-Belt Loop so it can be Carried Strong Side Vertically or Slanted for Crossdraw. It also has our spaced rivet system for piggybacking with any of our other sheaths. 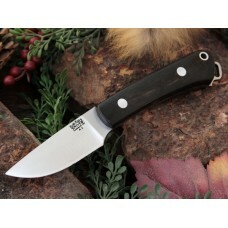 Bark River Mini Fox River African Blackwood. 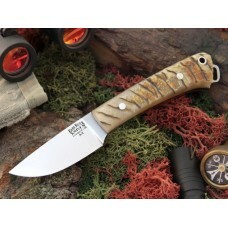 Comes with a new sheath that has the Sharpshooter Sele..
Bark River Mini Fox River Big Horn Sheep. 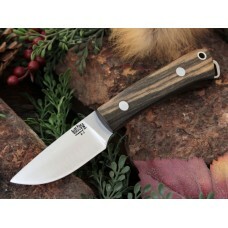 Comes with a new sheath that has the Sharpshooter Select-..
Bark River Mini Fox River Black and White Ebony. 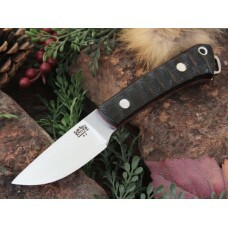 Comes with a new sheath that has the Sharpshooter ..
Bark River Mini Fox River Impala Red Liner. Comes with a new sheath that has the Sharpshooter Selec..